On An Overgrown Path: Who needs a designer concert hall? Who needs a designer concert hall? A recent post suggested that anyone who thinks I am overstating the disruptive impact of technology on classical music should use journalism as a case study. This view was vindicated by the announcement a few days later that the Independent newspaper will cease publication of a print edition. I also pointed out that the response of the London Symphony Orchestra to disruptive technology, surplus capacity, and faltering demand is to increase capacity by building an expensive new concert hall - aka museum of sound - for their designate music director Simon Rattle. Debate continues as to how Sir Simon should be provided with the hall he feels he deserves; which reminds me of this story about one of his illustrious predecessors in Berlin. Herbert von Karajan was conducting at the same Bayreuth Festival as Hans Knappertsbusch. Backstage in the Festspielhaus there were just two lavatories at the end of a long corridor. Karajan's personal secretary, it is said, put a notice on one, 'For the exclusive use of Herr Karajan'. An hour later a notice appeared on the other one written by Knappertsbusch, 'For all the other arseholes'. My post opined that non-celebrity professional and amateur ensembles - aka all the other arseholes - will have an important future role as they are better positioned to weather the inevitable collapse of classical music's top-heavy financial model. 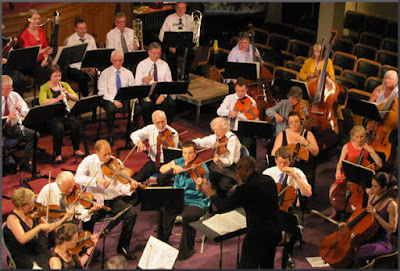 Among these ensembles is the Scarborough Symphony Orchestra in Yorkshire, England. On 30th April they perform William Grant Still's Symphony No.1, ‘Afro-American’ conducted by musician of colour Shaun Matthew - see photo above. This follows on from their UK première performance of William Grant Still’s Symphony No.2 in the orchestra's 2012 season. That the Scarborough Symphony should give the UK premiere of an important 20th century symphony is a sad comment on the myopic programming of the prestigious London orchestras. That the Scarborough orchestra give these innovative concerts not in a designer concert hall but in the town's Methodist Central Hall, is an even sadder comment on celebrity music making. Three weeks after that noteworthy Scarborough concert, Mahler's Eighth Symphony is performed by the augmented forces of the Norwich Philharmonic Orchestra & Chorus conducted by Matthew Andrews*. Performances of this gargantuan symphony are rare, and what makes this Norfolk and Norwich Festival 'Symphony of a Thousand' even more noteworthy is that the venue is a multipurpose exhibition hall at Norfolk Showground; thereby emulating the 1910 premiere performance conducted by the composer in the cavernous Neue Musik-Festhalle at the Munich exhibition showground. Finally, the thread of musicians of colour leads this post to Morroco. The town of Essaouira on Morocco's Atlantic Coast has many musical connections. Most notable is the famous annual Gnawa festival celebrating the music of the brotherhoods that practise the animistic rituals of folk Islam. Another connection that was explored here some years back is with rock music icons, including Jimi Hendrix and Cat Stevens. And Paul Bowles made some of his celebrated field recordings of Moroccan music among the Jewish community of Essaouoira in the early 1960s. But on April 29th Essaouira connects with a very different musical tradition when L'Orchestre Philharmonique du Maroc (Philharmonic Orchestra of Morocco) perform Mozart's Requiem. Formed in 1996, L'Orchestre Philharmonique du Maroc is a professional orchestra of eighty musicians; the majority of the musicians are Moroccan who are supplemented by Europeans, and their chief conductor is Frenchman Olivier Holt. Mozart is famous for his connections with secret brotherhoods, so Essaouira is an unlikely but appropriate venue for this performance of his masterpiece. The Requiem is part of the annual Printemps Musical Des Alizés classical music festival in Essaouira. Chamber music recitals are given in the atmospheric Dar Souiri, but larger works such as the Requiem are given in the multi-purpose Salle Omnisports. Like Scarborough and Norwich, Essaouira lacks a purpose-built concert venue, yet alone state-of-the-art designer hall. But there is still a burning passion for classical music, and that is what really matters. I will be at the Norwich Mahler performance; but very inconveniently, the Grant Still symphony and Mozart Requiem clash. So sorry Scarborough, as I have yet to master the art of bilocation, I will be in Essaouira. * An error in the original text regarding the anniversary of the premiere of Mahler's Eighth Symphony was corrected on 20/02/2016. Thanks go to Andy Olson for pointing out my error. No complimentary tickets or other rewards involved in this post. Any copyrighted material is included as "fair use" for critical analysis only, and will be removed at the request of copyright owner(s). Also on Facebook and Twitter. So many things here to savor, I can't begin to list them, except . . . William Grant Still! That is terrific, and your comment, "That the Scarborough Symphony should give the UK premiere of an important 20th century symphony is a sad comment on the myopic programming of the prestigious London orchestras" goes right to the heart of the issue. Bravo Scarborough! The hyper-sophisticated, jaded, cynical chattering class of classical music aficionados in London is so burdened, it seems, by the embarrassment of wealth that is life in the classical music performance capital of the world that somehow the prospect of building a concert hall absolutely unhinges them. Meanwhile, all around the world there is an explosion of new concert halls being built and they are meeting with a reasonable bit of acclaim. The truth is many of them are rather good both acoustically and architecturally. They are both large and small, elaborate and modest; some are astoundingly expensive others do much with little. Why they are needed or wanted and where the money is coming from is unclear to me, but two developments seem to be feeding this trend. One is the fact that acoustical modeling has enabled acousticians to be able to offer reasonable assurance that what is built will be rather good, acoustically. The other, is that the rigid, stultifying postwar modern architecture that gave London those concert halls it so loves to hate is a thing of the past. So, the idea that London can't afford or can't support or can't build a good concert hall seems absurd. But as an architect, I can tell you I wouldn't want the job and I rather wonder why Rattle wants to put himself through the stomach wrenching experience of being on the receiving end of boundless bitching, gripes and know it all second guessing. What get's built, if anything gets built, may be so compromised by the need to appease public opinion that...well, it may be exactly what the cynics expect. Perhaps the frightful Barbican Centre is as good as it gets...for London.